program your cellular memory today! DOUBLE-CLICK AUDIO ICON TO HEAR MEDITATIONS. Do you experience cramps, heavy flow, depression, anger, bloating, tender breast or any other discomforts during your moontime? Do you know why you keep experiencing the same discomforts month after month? Well, it has a lot to do with your cellular memory. Your thoughts program every cell in your body to a certain frequency. It continues to vibrate on that frequency until you change it. Some women who experience discomfort and pain during their moontime usually have these thoughts….. “I dread this time of the month” or “I hate having my period”. These type of thoughts are programing every cell in the body to remember the same painful experience, therefore the body will repeat the same pattern. This is called living unconsciously. When you live unconsciously, life lives you. I have created a simple yet powerful moontime intention ritual to help you change your cellular memory and allow you to make a deeper connection with your ancestors. 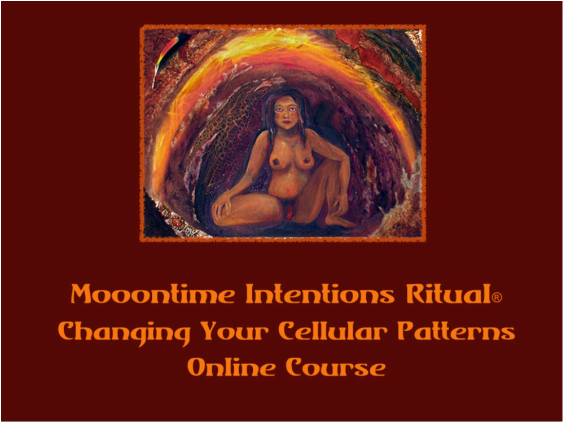 Sign-up today and start releasing your old cellular patterns and experience a pleasant powerful moontime. You will notice a difference immediately! "I appreciate you very much, how nice that this easy-to-integrate into our lives class was simple to follow through on, straight forward, profound and delightfully affordable. You make me glad to support this work, so keep putting that vibe out and well, if we (women in particular) all learn to authentically put that vibe out, the deal is done and we are all good!" Andrea M.
"I am on Day 2 of the Moontime Intentions & I feel my Womb's appreciation of me given thoughtful, meaningful intention & awareness to the Power within this space! I have always wanted to feel connected with my body more & being an active part of the shedding/regeneration process consciously is helping me to do that so thank you for helping to center even more awareness of this presence & our great ability to Work within this space. You are so Loved & Supported in this work!." Melissa D.